Cat fleas are probably the most common domestic ectoparasite, feeding on any war-blooded animal. In the United States and has been found on dogs, cats and over a dozen other animals including humans. Habits: Adult Cat fleas feed on blood with their piercing/sucking mouthparts, typically seeking food within two days after emerging from their pupal case. Habitat: Adult Cat fleas remain on the host throughout its life but may be knocked off by the animal’s scratching. Typically, flea larva are found in areas where the pet spends the most time. 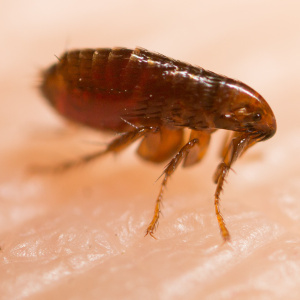 Threats: Fleas can transmit pathogens that cause disease, Cat fleas can transmit murine typhus from rats to humans, and cat scratch disease from cats to humans. Additionally, fleas serve as an intermediate host for tapeworms, which can infect your pet and occasionally humans.